A highly affordable city car that's a great choice for drivers who want a no-nonsense runabout that'll tackle busy urban streets and the tightest of parking spaces without breaking a sweat. The interior of the Pixo is functional, with a comfortable driving position and a reassuring amount of space that makes this car eminently practical. 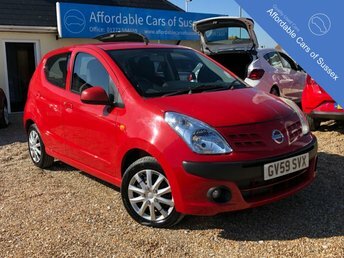 Take a closer look at the latest range of used Nissan Pixo models for sale in Peacehaven by paying a visit to Affordable Cars of Sussex today. You're guaranteed a warm welcome by our knowledgeable and friendly staff who will be more than happy to guide you through our current lineup of affordable used vehicles.